If you're not familiar with black seed oil, you should be! Black seeds, also known as black cumin or black caraway, are the seeds of the Nigella sativa plant. Their history of use for medicinal purposes dates back thousands of years, and modern research finds black seed oil promising for a variety of conditions. Due to its powerful antioxidant properties, black seed oil supports the cells and overall wellness. When taken as a supplement, black seed oil can help relieve inflammation in the body. Black seed oil supports a healthy cardiovascular system. It has been shown to have a protective effect on the heart, promote healthy cholesterol levels, and support normal blood pressure. Studies find that black seed oil may be helpful against multidrug-resistant bacteria. Black seed oil's active ingredients, including thymoquinone, thymol, and thymohydroquinone, have been found to inhibit a variety of different human pathogens and also have powerful antifungal properties. 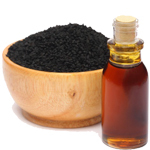 Black seed oil may have anticancer effects. Animal studies find that the phytochemicals in black seed oil inhibit the growth of cancer tumors in the colon, lungs, esophagus, and stomach. In one in vitro study, researchers injected a low dose of thymoquinone into cancerous human prostate tumor cells. It stopped the proliferation of tumor cells, no new blood vessels formed within the tumors, and the tumors stopped growing. According to research, black seed oil improves glucose tolerance and lowers elevated blood glucose, making it helpful for people with diabetes. Due to its favorable effects on blood glucose levels, black seed oil may also be an effective remedy for weight loss. Black seed oil is a natural source of vitamin E and B vitamins; the minerals calcium, zinc, and phosphorus; sterols and sterolins; proteins; and omega-3, -6, and -9 fatty acids. Multiple studies have confirmed that there are no long-term side effects of taking black seed oil on a regular basis, and there are no known side effects. However, it's important to consult with your health care provider before taking black seed oil if you're on any medications. Look for black seed oil in both liquid and capsule forms at your local natural market.